Products of theological reflection and divine inspiration. There is nothing more Biblical than looking back over our journey and paying heed to how far we have come, what we have overcome, and where we started. Last night, I started out by getting the final things together for my trip to St. Louis, and more specifically, Called General Conference of the United Methodist Church. It began as a practical endeavor. I opened my luggage and looked over the carefully packed outfits, supplies, and necessities. Then I started to get my carry-on bag in order, and that is the precise moment when things shifted. I grabbed some of the gifts I have been given for this journey: a blinged out notebook and matching pen, a hand woven bracelet, a picture frame with my son’s picture, and a set of markers for making visual statements on poster board I will purchase when I am in St. Louis. Each one is a thoughtful gift, but also a talisman of the giver, a small piece of them embodied in their thoughtfulness for me. I was caught unaware by this wave of sadness that washed over me, even as I smiled at the precious artifacts in my hands. I was getting ready to leave on an airplane that would take me to a city where a pivotal moment in United Methodist history would occur. I am excited to be there in person. I am anxious about what may happen. I am hopeful that God will make a miracle for my beloved denomination. I mourn that we Methodists find ourselves at this place where we know that hearts will be broken, fractures may become permanent, and some will choose to walk away from our family of faith. The reality of a Body of Christ comprised of human beings is that no matter what we do, someone is upset. Someone will leave. That is not a statement about this issue of human sexuality and inclusion, or even how we have handled it to this point, but the reality of living in community, even a Christ-centered one. I have been planning this pilgrimage since it was announced after the 2016 General Conference. I knew that I would need to be there, to see with my own eyes, hear with my own ears, and experience with my person the atmosphere of spirituality or its lack thereof. United Methodism has a concept of Holy Conferencing, when the Body of Christ gathers to be in prayerful discernment together, not just individual discernment while sharing same space. We believe that the Holy Spirit moves in a unique and powerful way when we come together to seek God’s will and word for us in this manner. I have seen it before. I have been part of it since becoming clergy. I know that it has a distinctive feel from any other gathering, meeting, or governing body. We have to engage and work at it, but there is nothing so powerful as God guiding one of the largest denominations in Christendom. I want to testify that it did occur. So here I am, all packed and plans confirmed, and there remains so much prayer to be done. Countless Methodists, and I suspect Christians from outside our formal membership covenant, are praying about this gathering. I hope we are not praying for our desire, our wish, our way, but God’s will. I hope we recognize that human will is powerful and can be manifested by our sheer willpower. Perhaps that too reflects the divine image in which we were all created (Genesis 1:26). Yet the challenge is to set aside our will, and create space first in our being, and then in the Church for God’s will to overshadow our own. That is what I envision happening when the Holy Spirit overshadowed Mary and she became the bearer of the Christ-child (Luke 1:35). If we, as the United Methodist Church, are to bear Christ to the world with our unique and vital theology of grace, then we must be willing to be overshadowed, so that God may be fully embodied. That is the hard part, but no less necessary. Last night, after checking all my packing one more time, I unpacked the one thing I do not need: my will. It was so heavy and burdensome. I did not realize how much so until I set it aside. Then there was all this room for the truly important and Godly things! I had all this room for hope for the future, openness to receiving God’s word, assurance of God’s providence, and the peace that no matter what does or does not happen at Called General Conference, nothing can separate us from the love of God (Romans 8:38-39). Now I am truly ready to journey to a place where my brothers and sisters of Methodism will converge from all over the world, and seek God’s will and way together. Now all my planning, packing, and praying have culminated in a heart ready for anything, because God is once more my everything. As I sit here in Pennsylvania, having presided over a worship service of Holy Matrimony less than six hours ago, I am struck by the juxtaposition of that celebration of love with this day of suffering and hatred in our neighbor, Charlottesville. While I am not with you in body, I have been joined with you in prayer, and am with you in spirit now. I have too many words. There are words of anger and outrage at the suffering of an entire community. There are words of sorrow and mourning for those who lost their lives and those who have been harmed in the course of events that escalated because of hatred lived out in violence. Mostly there are words of prayer and supplication, as I cry out to God for relief from the kind of human sinfulness that can only be satisfied by hate-filled words and causing public fear. My heart breaks for our community. I am not going to sit here and offer some form of analysis for what went wrong. We do not need that, because I think it is obvious: what we experienced was sin. It is a sin to hate another person. It is a sin to use violence against another person. It is a sin to make another human being feel anything less than the beloved child of God that our Lord created them to be. It is a sin to strip another person of the dignity with which they were endowed by our Creator while they were still in the womb. Those that gathered in Charlottesville to proclaim their hatred and cause fear sinned, and brought evil into our midst. It literally crashed into our lives, our peaceful community and caused death. I do not need anyone to decry that. It is obviously wrong, a sin, and evil to murder another person. There is no excuse, no other side, and no option to ignore what happened. We shall not. We shall not forget what happened when human beings decided to give into their hate and cause hurt. Hatred never stays a feeling, a harmless sentiment. It eats away at us, poisons our minds, and perverts our hearts until it has no where left to go internally and ruptures into our world, often in words and acts of violence. We saw this today. So our work as people of faith and servants of Jesus Christ has only begun. There is no longer Jew or Greek, there is no longer native or immigrant, there is no longer slave or free, there is no longer black or white, there is no longer male and female, there is no longer heterosexual and non-heterosexual; for all of you are one in Christ Jesus. It is a sin to hate a person God loves, and just because you might temper that word “hate,” do not think that God is fooled. We are all sinners. We are all in need of the grace that only Christ provides. We can all be transformed from sinners, and liberated from our hatred. So we start with ourselves, and we no longer let each other speak the language of prejudice that makes hatred of another person socially acceptable. Change starts with us, and Christ has freed us for this very purpose, this holy cause. We need to raise the children in our homes and in our community to love as God loves, and reject the sinful divisions humankind has created to reinforce a false hierarchy that raises some up by forcing others down into the depths of an unholy social prison. In this country, people have the right to hate, but we are not building an earthly kingdom of legalism, we are building the Kingdom of God, and there is no room for hatred here. Let there be peace on earth, and let it begin with us. Poured out in our lives from human vessels. Save us from this sin, Almighty God. And continues to cause pain, suffering, and bring forth violence. We know that we have work to do to purge this sinful hatred from the world. Which rejects hatred and prejudice against any other person. And we cannot allow it to be spoken and lived out in our community. Your guidance to help us accomplish this holy purpose. We are not willing to accept hatred as a reality any longer. And you proclaim that greatest of our attributes is love. Let it be so, in accordance with your will. Back in April, I was invited to be part of the journey to ordination known in United Methodist Church as the Provisional Process. Ironically, I had just been there and done that, but as a Provisional Elder myself. I just celebrated my one year ordination anniversary last month, and about six months into my first year I was being asked to be present with and mentor to those who were beginning their journey in the process. Like most of those called by God in the Bible, I felt fear. I wondered if I could, if I was worthy, even capable. I thought that surely there were others more qualified than I. Then, as God always does, God settled my fears and whispered into my heart those words that have brought me into service countless times in my life: I am with you. My mind had a snarky reply: You’d better be! Of course God was, is, and ever will be. I serve a local church where God permeates everything, even the physical space. God is manifest in our worship, our love for others, our service in the name of Jesus Christ, and our intense desire to reflect the grace by which we have been saved. No amount of sin, failure, or mistakes can stop Christ from being at work in the Church, or those of us who call the Church our home. Yesterday I gathered with fifteen clergy for their first Provisional meeting since being commissioned during worship at the Virginia Annual Conference in June. They vary in age, reflect a range of seminary and educational experience, are diverse in ethnic and gender, and yet are all equally committed to this call from God to serve the Church in the specific role of clergy. They refuse to let fears and talk of a denominational break stop their servant leadership, even when their ordained colleagues speak of it incessantly. Thank God for that kind of fearless commitment to the journey, to the Church, and to Jesus Christ. They reminded me that God is with us, not just in the presence of the Father in our consecrated, sacred spaces, or as the Son when two or more are gathered in the name of Jesus Christ, or even in the movement of the Holy Spirit, but in those who bear the mantle of clergy to serve the Church, and ultimately that parish known as the world. My life experience has countless examples of God reassuring while my spirit was assailed by fear, and God providing what I needed to move from merely surviving to thriving with confidence in the exhortation of Jesus not to be afraid (John 14:27). 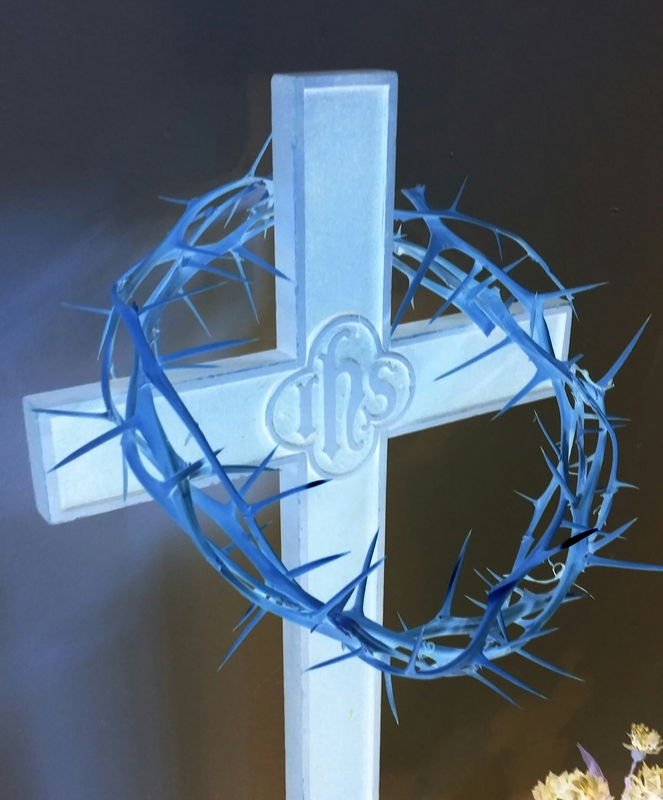 My Lord who refused to be stymied by disciples who could not comprehend his messianic mission, fell victim to fear, and fled in the face of the suffering and death at the cross. I cannot help but think that by creating the opportunity to be on this faith walk with these Provisionals, God has once again given me a stronghold and gift of assurance to carry me through this time of prayer and waiting to discover the future of my cherished United Methodist Church. You may not be physically present with us when we gather, but believe me when I tell you that God is doing something there for the good of Christendom, and no threat to my beloved denomination will prevent God’s will from prevailing. God still calls good and faithful servants to lead. God still nurtures them into the servant leaders we need. God will not abandon us, and God remains greater than any denomination. If like me you call yourself a Christian, and seek to fulfill your call to be a disciple of Jesus Christ, then trust me when I proclaim that the future looks bright indeed. I have seen it in the faces of those who will lead when I am gone, and my heart is not just warmed, it burns with gratitude to God. There’s no room for fear, as it has been replaced with greater faith in Christ. The Book of James tell us that God does not change: “Every generous act of giving, with every perfect gift, is from above, coming down from the Father of lights, with whom there is no variation or shadow due to change” (James 1:17 NRS). Perhaps we can take comfort in the steadfastness of our Lord whose love never ends and grace for us does not waver. Maybe we need to be reminded of that more than ever when things change in our lives. I have been through much change in the thirty-five years of my life. I have moved more than nine times, and am preparing for my tenth. I have been married, and then divorced; a change I never would have anticipated. Becoming a mother continues to be a daily encounter with change. My life changed again when I unexpectedly met the man who would become my new husband, step-father to our son, and partner in ministry. Now I am at the culmination of my journey to ordination and my first appointment as an ordained Elder. This is change. It means life in flux, and the transformation of self and circumstance. I could be frightened. Some might say I should be scared, but I am not. I believe that God is at work in my life and my ministry, and God is active in this change. Perhaps I am foolish to feel so at ease, or perhaps I have reached a point in my faith life where I am so grounded in God that nothing can shake me, unless I let it. Change can be difficult. I am deeply invested in my current congregation in Norfolk, VA. I have been with them for eight incredible years. They have been invested in me from the first stage of declaring my candidacy for ordination to its completion this June. We have been through countless trials and tribulations. We have experienced the fullness of human emotion together, and emerged stronger. God has knitted us together for a time, and I have been blessed to be bound to them. But now that bond is being severed. I am being called to a new congregation, and there is much to mourn about this separation. The miracle of God is that even in the sadness and mourning, there is so much to anticipate with hope and joy. I have been granted gifts and graces in ministry which are needed, valued, and desired. God has moved hearts and minds to send me to Crozet, VA, not least of which is my own. My hope is not at the expense of my current congregation either. God has made sure to send them a new pastor with his own gifts and graces, and passion for ministry. When he arrives, the Holy Spirit will begin to knit him and the congregation together, weaving the next panel in a tapestry of their identity. While I am only beginning to know him, I know that we serve and honor the same Lord. I can trust that the God who called me and upheld me, can and will do the same for him. It is a blessing to fathom the graciousness of God in this time of transition. This is the tale of only two churches in transition, but spring in the United Methodist Church is a time of profound change for many churches and their congregations. The Body of Christ is being made and remade all over the world. There are many who will be frightened of the future, and that is an honest emotion. There will be others who will find this serene sense of God sweeping over them, and if we find ourselves in that category, then we are duty bound to share that comfort, while still allowing space for the ambiguity of change. This is a time to draw near to God and one another. It is an opportunity to cling to our faith rather than digging in our heels against inevitable change. I am praying for all those who are in the throes of change. My deepest prayer is that we can allow change to be a time of transition, moving from one state to another with grace and the preservation of human dignity. God may be unchanging, but in the midst of change we just might see God in the most profound ways, and come to understand the claim God has on our lives. May any change we experience be filled with tangible signs of God’s presence and providence. May we stand firm in our faith, even when the ground seems shaky. I think those of who have been part of the Church for all or most of our lives can easily forget that transformation into a Christian and then into a disciple takes place over time. I realize that many people have this moment when they are willing to declare their faith in Jesus Christ, but that is often proceeded by encounters with others of faith who inform and provide the necessary seeds for faith to take root by the power of the Holy Spirit. Even Peter, according to the Gospel account of Luke, first heard Jesus preaching to the people on the shore (Luke 5:1-3), then witnessed the miraculous catch (Luke 5:4-7) before he fell to his knees and pleaded with Jesus to withdraw from him because of Peter’s sin (Luke 5:8-10). Peter was not ready to follow Jesus then; he asked him to leave! But it was a turning point, the beginning of a dialogue and relationship that would EVENTUALLY lead to transformation of Simon Peter, the fisherman, into Peter, the fisher of men and women. Have we so easily forgotten that the Twelve, who followed Jesus for the three years of his earthly ministry, were still confused and scattered at his arrest, trial, suffering, and death? They started to follow at Jesus’ invitation, but they were not complete then too. It would take years of encounter, experience, and witnessing the countless miracles (feedings, healings, and mighty acts) to be in a place to finally be transformed into the disciples we know as those who first spread the Gospel of Christ. I think that Scripture prepares us to be part of the long haul of making disciples. If we follow Jesus’ model, and I think we should, then we have to cultivate relationship and have a conversation that will last years, and not all of that with words. While that same sacred text reveals instances when people immediately became believers, we have to recognize that profession of faith, declaring oneself to be a Christian, is not synonymous with becoming a disciple. A Christian professes belief in Christ, but a disciple follows Christ and his teachings. This world is filled with those who believe, but not all will follow. Just as dozens came into Jerusalem with Jesus, believing in him, but only a faithful few followed him to the cross, while the others scattered in fear and self-preservation. Many profess Christ in their hearts and even with their mouths, but are not willing to take the next step and profess him with their lives. If every person who self-identified as a Christian lived that out, then this world would be a very different place. Love of God and love for others would overflow tangibly. So why it is that there is this pervasive expectation that we immediately condemn the sinful actions of others, expect them to convert to faith in Christ, and be instantly transformed? While Peter self-identified as a sinful man, he did not stop his sin immediately, but he did immediately start the path by engaging with Jesus. Peter would continue to sin, denying Jesus the fulfillment of the Messianic prophecy in suffering and death (Matthew 16:21-23), and denying Jesus himself (Mark 14:66-72), yet he remains an example to all those who would seek to become disciples to persevere over time. Jesus did not begin his relationship with Peter by declaring Peter to be a sinner and demanding he repent. Instead he asking him to come along, to be with him as he lived out his divine purpose. As clergy, I cultivate relationship long before I can speak into the heart to evoke change. I have to build trust, earn respect, and model what I preach and teach. Only then do I stand a chance of being a vessel of God’s transformative love and grace. Even then I am a part of a larger narrative of other faithful followers, disciples who bear Christ’s name and love in this world. Jesus never modeled a love them and leave them ministry. He entered into conversation, went to people where they were in their daily lives, and invited them to experience something wholly and holy other. Some listened, some ignored, but those who chose to continue the dialogue stood the best chance of being truly and lastingly transformed. But even we who have been a part of the Church for so long should be mindful that we have had instances of rejection of the Gospel, refusal to follow, and backsliding. We are not perfect disciples either. While I do not think we claim to be, sometimes our manner of interacting with those outside of the Church communicates a sense of superiority and exasperation with those who have not entered into our fellowship as full members. We cannot expect everyone to immediately become Christians much less disciples, and we should be quick to engage rather than condemn. Transformation is the goal of the Gospel and that takes time. Are we willing to practice patience and invest it in the very people to whom Christ sends us? If you have been following the drama in the Rowan County Clerk’s office, then you know that a Kentucky public official has refused to issue marriage licenses to gay couples. She has now been found in contempt of court, and you can read the update here: Kentucky Clerk’s Office Will Issue Marriage Licenses Friday – Without Clerk. The topic came up at my Bible Study yesterday morning. This clerk, an elected public official, is charged with issuing a legal document for marriages, and she has refused to do so since the Supreme Court legalized gay marriages in the United States. Many religious spokespersons and political leaders have supported her stance. I do not. It is not about supporting or opposing gay marriage from a Christian stand point either. In the United States, couples, both heterosexual and now homosexual, have the right to be legally married. That may have nothing to do with Holy matrimony. Holy matrimony is a covenant made before God and consecrated, made sacred, by the blessing of God upon the individuals and the union. It is officiated by clergy, acting on behalf of the Church, and done within the context of a worship service. The language is specific and includes prayers, Scripture readings, and the invocation of blessings. As clergy, I officiate Holy matrimony. It just so happens that the Commonwealth of Virginia, where I reside and serve a local church, recognizes my authority to perform Holy matrimony as valid for legal marriage as well. So that, if a couple goes to the courthouse and fills out the proper paperwork to obtain a marriage license no more than sixty days before their wedding ceremony, I can fill out the license, submit it to the court, and then the Holy matrimony is also a legal marriage, but this does not have to be the case. I can and have performed Holy matrimony without it being a legally recognized marriage. God does not stipulate that Holy matrimony be a legal change in status for secular institutions and governments. What the Rowan County Clerk fails to realize is that her objection on religious grounds is inconsequential because the Supreme Court did not and could not require religious institutions to perform Holy matrimony for gay couples. There are certainly many Christian denominations and churches that do, but it has never been required by the United States government. Holy matrimony is under the Church’s purview. If the County Clerk wishes to belong to a church that does not perform Holy matrimony for gay couples, then that is her prerogative, but to withhold a civil license for a secular purpose is ludicrous. Her argument is even judgmental and flawed. While I understand that she is against Holy matrimony for gays, she has been providing legal licenses for heterosexual couples without any proof or knowledge that they are justified to be married from a religious stand point. She performs no premarital counseling, as I and most clergy do. Premarital counseling is not just to makes sure a couple understands the gravity of their request to be married or that they have proper communication and conflict resolution skills; it allows the officiating clergy to be comfortable with presiding at the covenantal ceremony. I will be asking questions that are part of a life long commitment ratified before God. I need to know that there is no abuse going on. I clarify that both parties understands divorce is not the way God intends for marriage to terminate, but to last until death parts them. I make certain both parties desire this union and are committed to it. I am acting on behalf of the Church and calling upon God to be witness. I do not take that lightly. Even as a Christian lay person that would not be the Clerk’s role, and she lacks the training and religious authority to make that judgement call. I have no doubt at least one heterosexual couple has been issued a marriage license during her tenure for whom I would not have felt comfortable or confident performing Holy matrimony. No government entity is requiring religious institutions to perform gay marriage ceremonies. We are still free to keep Holy matrimony as heterosexual or as universal as we please. Christians need to remember that there are things of God and the Church that are not tied to legal status and secular recognition. Holy matrimony is one of them. Even if state and federal governments suddenly stopped recognizing Holy matrimony as legal marriage, clergy would still perform the covenant. Just as baptisms and Holy communion have no legal bearing, they are sacred to us and have infinite value to those who partake in their grace. Holy matrimony and services of death and resurrection (funerals) are the same. Some Christians need to stop looking for a fight, and taking every opportunity to be outraged. Instead, let us focus on whether we are living out the Gospel of truth, hope, and love. There is plenty of work to be done, and fighting over legal paperwork is probably not high on Christ’s list.